Kyle Grillot - kgrillot@shawmedia.com Danny Delvecchio of West Dundee (left) and Matt Morgan of Elgin fight for control of the puck during the Pond Hockey Tournament at Woods Creek Lake Saturday in Lake in the Hills. Each of the 14 teams play at least two games on one of the four rinks and the winning team gets to skate the national anthem before the start of a Chicago Wolves game. 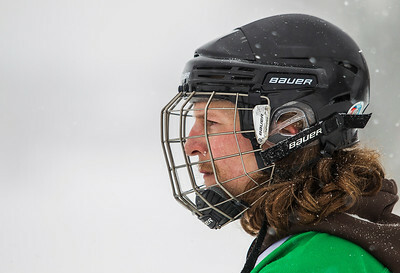 Kyle Grillot - kgrillot@shawmedia.com Danny Delvecchio of West Dundee watches as his team Teows and Confused plays the Grayfarm Geese during the Pond Hockey Tournament at Woods Creek Lake Saturday in Lake in the Hills. Each of the 14 teams play at least two games on one of the four rinks and the winning team gets to skate the national anthem before the start of a Chicago Wolves game. 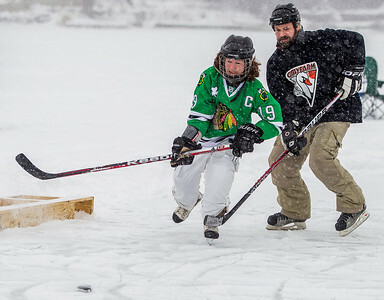 Kyle Grillot - kgrillot@shawmedia.com Danny Delvecchio of West Dundee (left) and Tim Morgan of Elgin fight for control of the puck during the Pond Hockey Tournament at Woods Creek Lake Saturday in Lake in the Hills. Each of the 14 teams play at least two games on one of the four rinks and the winning team gets to skate the national anthem before the start of a Chicago Wolves game. 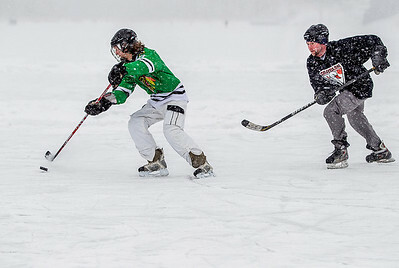 Danny Delvecchio of West Dundee (left) and Matt Morgan of Elgin fight for control of the puck during the Pond Hockey Tournament at Woods Creek Lake Saturday in Lake in the Hills. Each of the 14 teams play at least two games on one of the four rinks and the winning team gets to skate the national anthem before the start of a Chicago Wolves game.